Writing a creative personalization copy to engrave on an award could be a challenging task. However, if the personalization copy matches the award theme, the presentation becomes infinitely more effective. 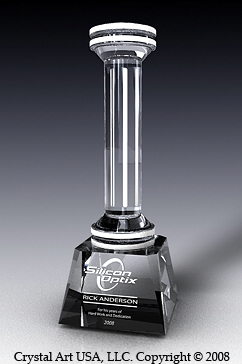 In this article we will review popular themes and suggest creative personalization copies for our crystal awards and trophies. Lets start with the star theme. Our crystal star awards are perfect for recognizing spectacular achievements. They are given to the top performers within organizations. Therefore, when writing personalization text you may want to use the following phrases: "star achier", "rising star", "shining star", "reaching for the stars". Our crystal mountain awards symbolize special achievements and attaining success through overcoming obstacles. Climbing mountains is challenging task that is rewarded with a spectacular view at the top. Popular phrases to use are: "conquering heights", "scaling peaks of success", "ascending to the new horizons", "rising to the top", "taking our organization to the top". Eagles symbolize freedom, courage, patriotism, strength, power, influence, and vision. Our crystal eagle awards are presented to recognize leadership, loyalty (years of service), commitment to justice. While writing a personalization copy you may want to say: "thank you for your courage", "you soar high above the others", "your visionary spirit is an inspiration to us all", "just like an eagle you live for freedom", "you lead others to the new heights of success". When an individual is being recognized for actions that have a world impact or global effect, our crystal globe awards make ideal tokens of appreciation. Phrases to use are: "your actions transcend borders", "the humanity is in debt to you", "thank you for your worldly achievements", "loves knows no borders", "your kind acts carry global impact". Our crystal award flames symbolize many inspiring concepts among which are: passion, eternal fire, creative spark, ingenuity, legacy. Flame awards may also be used as commemorative gifts. Try using the following meaningful words on our flame series: “you ignite others with your passion”, “you rekindle hope in our hearts”, “like Prometheus you lead us with your passionate fire”, “you enlighten others with your vision”.